TERRIERS (Topographic Experiment using Radiative Recombinative Ionospheric EUV and Radio Sources) was a mission to study the ionosphere. 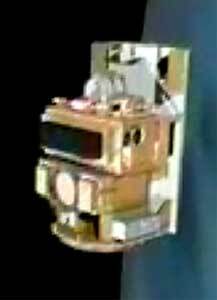 Gas Ionization Solar Spectral MOnitor (GISSMO) is an optics-free solar EUV spectrometer. It is designed to monitor solar EUV emissions in the wavelength range from 7 to 40 nm. TESS is a Single element imaging spectrograph (SEIS) designed for both high wavelength and high spatial resolution (in one dimension). After the first 3 contacts it was clear that the spacecraft's attitude control system was not functioning properly, since the solar array was pointing away from the sun and the system was nutating. Sometime shortly thereafter the spacecraft ran out of battery power. Further attempts to reactivate the spacecraft failed. TERRIERS is one of three satellite projects selected for the Student Explorer Demonstration Initiative program (STEDI). STEDI is funded by NASA and managed by the Universities Space Research Association (USRA).